When prioritising development projects in Sarawak one might consider the many rural communities still lacking basic infrastructure and amenities such as clean water, electricity and access to adequate schools and hospitals in the state. Not many would see the urgency of a musical fountain and light show in the state capital of Kuching. But, this was a project reportedly thought up by Chief Minister Abang Johari in March of 2018 and shrouded in secrecy until its grand unveiling just months later. The Darul Hana Musical Fountain, situated in front of the State Legislative Assembly (DUN) building and next to the Darul Hana Bridge on Kuching’s Waterfront was launched on 14th October 2018 in conjunction with the 82nd birthday celebration of Governor Taib Mahmud. 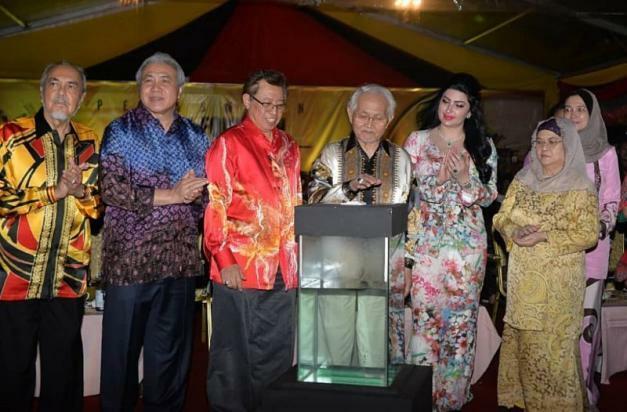 It was clearly a fitting location for the former Chief Minister’s birthday celebration, considering both the Darul Hana Bridge and the DUN building were projects he benefitted from, having been awarded by his own government to the Taib family-owned conglomerate Cahya Mata Sarawak (CMS). In the days following the launch of the project however, sufficient questions began to arise about the project’s procurement process, its lack of transparency and over-inflated costs for the Malaysian Anti-Corruption Commission (MACC) to initiate investigations. According to Batu Lintang assemblyman See Chee How, the singing fountain had been excessively priced at a jaw dropping cost of RM31million. For comparison he cited the Darul Hana Bridge, which had cost the state RM35million and the soon to be completed floating mosque which is projected to cost just RM10.6million. See also questioned why the project had been awarded under a “negotiated contract” and was therefore not open for public tender. When questioned by reporters over these basic concerns, Abang Johari declined to comment. Pending assemblywoman Violet Yong also called for MACC to investigate what she said was a “blatant abuse of taxpayers’ money” and she agreed that the fountain was overpriced and unsynchronised. Safety concerns have also been raised related to exposed electricity cables. 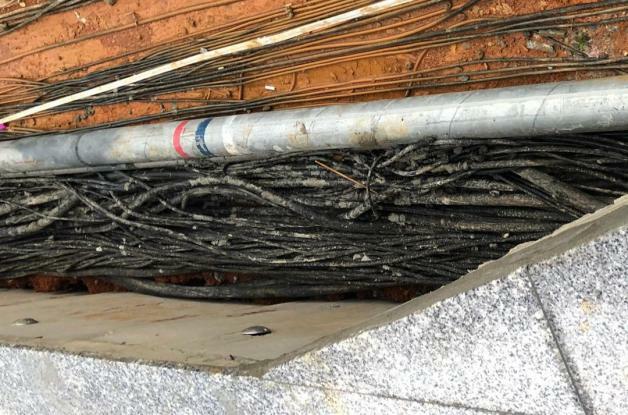 Exposed cables at the site of the fountain. Was construction to the highest of standards? Without any due process or basic transparency on the part of the state government about how this project was being funded or managed, details of the contract have been kept out of the public domain. So it wasn’t until a signboard was spotted from inside the DUN complex that details began to emerge. The signboard identified the project as the “Proposed Design, Supply and Installation of Waterfront and Musical Fountain at Dewan Undangan Negeri Sarawak (DUN), Kuching”. The client was Kuching North City Commission (DBKU) and the contractor was a private company called Autopower Consultant (M) Sdn Bhd. So who’s behind the company that was given a taxpayer-funded contract under such secretive circumstances? 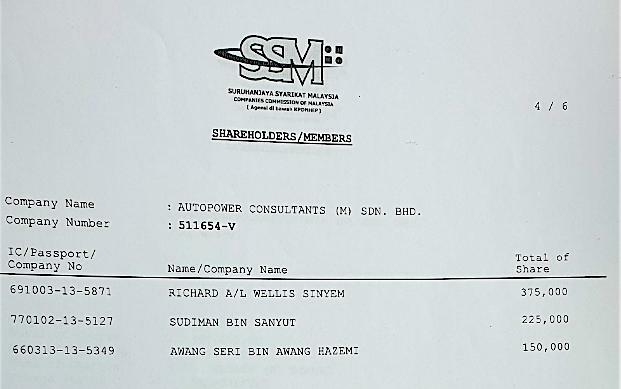 Official company documents reveal that Autopower Consultant was incorporated in 2000 and registered at Tabuan Stutong Commercial Centre in Kuching as a general contractor and investment holding company. It is directed and owned by just three individuals; Richard A/L Wellis Sinyem, Sudiman bin Sanyut and Awang Seri Bin Awang Hazemi. No director names or director biographies are listed on the Autopower Consultant website, so the credentials of these individuals who have been awarded with such an enormous publicly funded project are hard to scrutinise. Why did Autopower get the contract under such secretive circumstances? In 2017, the Sarawak state government set up a ministerial portfolio under the Chief Ministers Office called Integrity and Ombudsman for the purpose of “tackling corruption and malpractices” in the state. The new Minister, Talib Zulpilip was sworn in by Governor Taib in May 2017. It might seem an unlikely move to be supported by Taib, given the swathe of corruption allegations that have plagued the state under his very leadership, mostly involving himself and his business cronies. So, perhaps little surprise that Zulpilip is a former director of CMS, the Taib-family owned company beset with its own set of corruption allegations. Even less surprise that Zulpilip has defended the Darul Hana Fountain in his capacity as Sarawak’s ‘Anti-Corruption Czar’, claiming the project complies with the Standard Operating Procedure of Kuching North City Commission and the Local Authorities Financial Regulations Act. DBKU have reportedly welcomed an audit by the Auditor General’s Chambers. 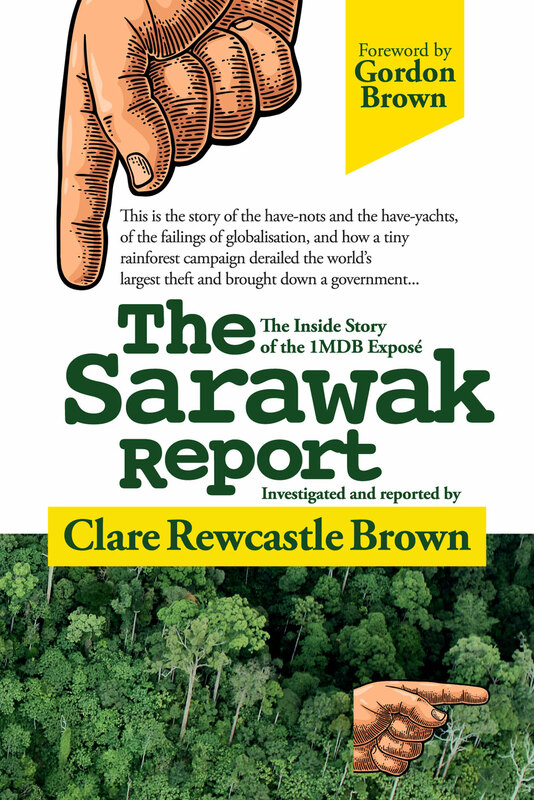 It is high time for federal overview of Sarawak’s conflicted contracts, secretive procedures and blatant corrupt practices. So will the MACC take action to investigate what appears to be the latest shady deal in Sarawak? The public are entitled to know the full details and breakdown of this project including evidence of any needs-based assessment and cost benefit analysis.